As my time on Canada's east coast draws to a close, the saddest thing is saying goodbye to my sister, Kirsty (whose blog you will find linked to this one), and her wife, Manue. They've been superb hosts, and I think enjoyed having me around. Still, we've been living in a one room loft, so I'm glad to be giving them some well deserved privacy. As it happens, the last two and half weeks in Montreal haven't been nearly as eventful as the previous four, but that was precisely the point. This part of my travels was always meant to be chilled-out, cheap and cheerful. Thus long days lying in the sun reading my book were just the ticket. Still, there was time for a brief trip to Ottawa, some very expert belly-dancing complete with a real live snake and fire-sword (I was watching rather than belly-dancing, in case you were wondering), strolling around the (gay) Village, purchasing a certain pair of jeans I'd had my eyes on since San Francisco, helping Kirsty and Manue clean and paint their new apartment and then move into it, and of course sampling Montreal's fine French pastry, especially the divine Croissant aux Amandes et Chocolat. But in line with my desire to do not much at all, the highlight of my time here was simply hanging out with Kirsty and Manue, seeing how they live their everyday lives. I've never watched my sister in a relationship before, and while I had met Manue several times previously, this is the longest continuous time we've had to get to know each other. I'm glad to report that we all got on famously, and that Kirsty and Manue are demonstrably happy, safely ensconsed in their lives together. It's been fantastic getting to know Kirsty's life here in Canada. 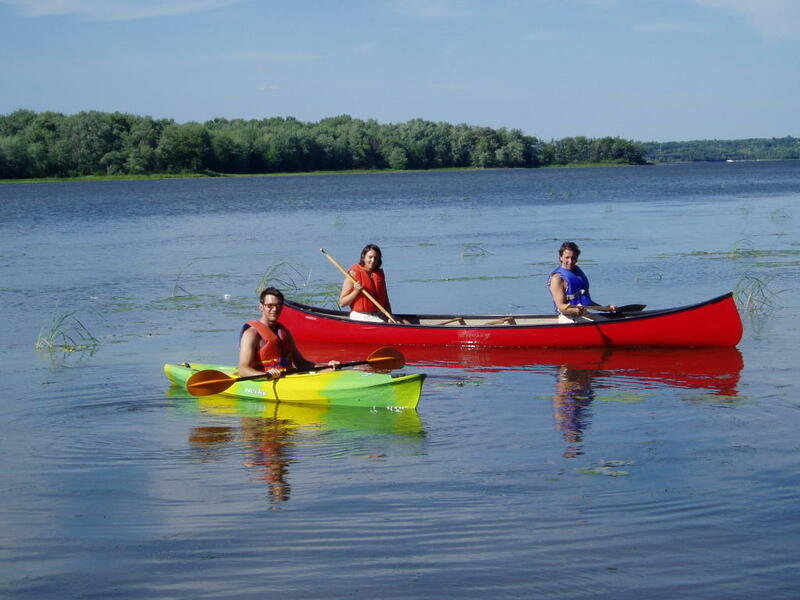 The photo above is of the three of us canoeing on a lake by Manue's father's house in the suburbs of Montreal. They also roped me into helping them move, which included painting their new apartment. Me with a paint-brush and roller in hand...Hamish would have been proud. What was great, however, was that Manue's mother, Dominque, and brother, Edourd, came down from Quebec City to help as well, meaning I got to meet them again. 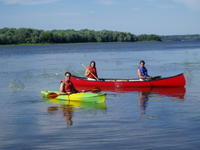 Who would have thought hanging-out with my sisters in the Land of the Beaver could be so enriching? Otherwise, just sifting about in Montreal confirmed my impression that this is one of the great cities of the World. It seems to have all the good things about North America without some of the excesses I observed in California. It's a big city, but clean, relatively uncongested and easy to get around. And on top is the overriding "Frenchness", giving the city something palpably unique. I felt self-conscious not being able to speak French, but that was more to do with my own feelings of inadequacy rather than any annoyance on the part of Montrealers, most of whom spoke excellent English. I also took a stroll up and around the McGill University campus, which came pretty close to being my university of choice. Given my feelings about Montreal, and the fact that Kirsty lives here, I definitely felt some pangs of "what if...". Of course, had I chosen McGill rather than NYU, the alternative pangs of "what if..." would almost certainly have been more intense. I guess the big "event" in Canada was our weekend away in Ottawa. It's only a 2 hour drive, and since Kirsty has a NZer friend there, Robyn Devane, we decided to rent a car and make our way down to check-out the nation's capital. I even got to drive there and back, on the right-hand side of the road no less, in a large Chrysler Seabring. It felt very American, indeed. Ottawa is very much a capital city with large, some very ornate, public buildings, Canadian and provincial flags flying everywhere, a public service feel and so on. But still large enough to be interesting and lively. Not wanting to offend the land of my father's birth, but I had to contrast Ottawa with Canberra as both have a similar feel...Canberra is a "nice" public service town, but I'm afraid there's not much going on when measured against Ottawa, which was comparatively (and relatively, for that matter) dynamic. Nonetheless, I was glad to carry-on my proud tradition of visiting nations' capitals...many of you will remember my scintillating comment on the dome of the Riechstag and how many EU flags were flying in different European capitals... Once I get to DC, I'll have a North American trio - Mexico City, Ottawa and Washington DC. 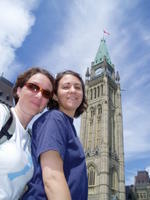 Kirsty and Manue underneath the Peace Tower at the front of the Canadian Parliament. See more photos of Montreal and Ottawa on my webshots page. Speaking of the States, I head down to New York tomorrow morning - yikes! I'm pretty excited, although my "to-do" list for when I get there is rather long. If only America worked less like a federation, I could have got a social security number and opened a bank account in California (I wasn't able to do either), and life in New York would have begun much more easily! Still, it'll be an experience getting everything organised...perhaps the subject of my next post. It was fantastic to have you stay. Seriously very cool. And I'm glad you got to kick back a bit and get a feel for Montreal. I loved reading your first blog as a lot reminded me of my own similar experience in the US (bars closing so early, everything being BIG, and not being understood as a native speaker). I am EXTREMELY excited about your arrrival in NYU. It is great that you know a few people already and you will be straight into an intense period of meeting more. I can't wait to hear how it all goes - country bumpkin goes to the big city! (Well, noone would call you a country bumpkin but you are from the wairarapa...). china tours site/blog. It pretty much covers china tours related stuff. "Anyone in the area ... Please rescue Mr. & Mrs. Arnold Sabathia at 3324 Danneel St. I have a home business work at home site. It pretty much covers home business work at home related stuff. I have a home loan site/blog. It pretty much covers home loan related stuff. Well, congrats on the comment spam. You're a blogger now. Nice Site - your are ##keyword##!! But he admits he is a Rich Jerk - and wants to show you how he made it. Hi, I was browsing the Web and came accross your site. I am pretty new to blogging and everything but it seems pretty fun. I have a site about clinical depression that I just started last week. Well, I just wanted to comment and say you have a neat blog. keep it up and have fun blogging!